He’s a little emerald firecracker with bright blue wing tips and an alert, intelligent gaze. I acquired him in 2014 as part of a research project on parrot communication. He was my first pet since leaving home, and his presence is a constant in my home. He’s been through two boyfriends, a college graduation, five houses (all with me), and far more house parties than should be allowed for pets. He’s even been camping in the Grand Tetons with me! He loves company and charms people with his mimicry of giggles and coughs. I adore this bird. But some days, his eyes go hard and flat. He bows his head and flares his wings around his shoulders, opening his mouth in a hissing gape. When I approach further, he lunges. If I persist, he’ll bite. If I’m really stupid about ignoring body language, he’ll hang on and really dig into my flesh with his incredibly sharp beak. Some days, my beloved little velociraptor erupts with earsplitting screeches and then lunges against the cage bars when I draw close. On these days, it’s impossible to remove him from the cage to feed him, clean the cage, or move him to his sleeping perch. Usually, those days are few and far between. His 106 grams of fury is often directed at someone other than me. That person probably wronged Francis somehow by not sharing their food or putting a sheet over his cage while they talked on the phone. And it’s fine, really. He’s not their bird. He’s mine. So what if he’s not a big fan of them? It’s not like they feed him, anyway. Like many things in life, that sentiment runs true until it doesn’t. Several months ago, Francis started to scream more. He was reluctant to step up onto my finger and often lunged if I moved too quickly. Some nights, he wouldn’t step up for me to put him to bed. He drew blood on me three times in a week when he bit down hard. I was at my wit’s end. There are lots of ways not to stop parrot biting. Thoughts of finding him a new home ran through my mind. Curses flew from my lips when he’d scream, lunge at me, and then scream again. I came up with a variety of creative and morbid threats to hurl at him in quiet tones when I was frustrated (my favorite involved boiling him and feeding him to the dog). Ignoring him did nothing. I put towels over his cage when he screamed. I left the apartment. Nothing helped, and I knew that I was nearing a breaking point with him. Then I sat down one day and stared at him. He cocked his head, his head feathers fluffed up in the cutest way. I spoke quietly to him and he murmured gibberish back. I extended a finger, and his pupils pinned. He lunged at the bars, screaming, and retreated to the furthest corner of his cage. I took a deep breath and withdrew my hand. Yelling or throwing a fit would either reinforce his behavior (many parrots love noise) or scare him and just reinforce his belief that I’m something to be kept away from him. I took a few more deep breaths and tried to take a mental step back. I needed to stop feeling like a victim of my parrot. Loving him wasn’t enough. Ignoring him wasn’t working. Threatening him obviously did nothing. I needed to put my psychology hat on and think through this like a real animal trainer. That’s how to stop parrot biting. 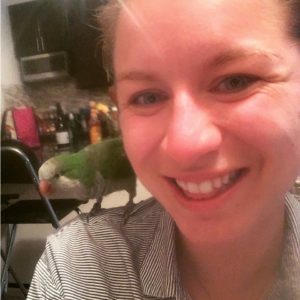 Training my parrot not to bite doesn’t have to be a huge endeavor. Francis and I have just a few quick steps to stop parrot biting. Classical Counter-conditioning. Every time I approach Francis’s cage, I hand him a treat. I usually use safflower seeds, but anything that your bird loves will do. Yes, I do this even if he’s lunging and screaming and trying to bite. The goal is to teach your bird that people = food. Eventually, he’ll start being excited to see you again because you mean seeds! If you’re worried about rewarding your bird for being an ***, think of it like this. There’s a bully in your high school. Let’s call him Brutus. He walks around scowling and shoves people in the hallway. Sometimes he’s an OK guy, making jokes in class. He’s actually pretty smart. Just mean in the hallways. You decide that you’re sick of being shoved around. So everytime you see Brutus, you smile and offer him some gum. You do this even if he just shoved someone else or is scowling threateningly at you. The first few times he calls you names or even shoves you. But as time goes on, Brutus will probably decide you’re an OK person, too. He’ll stop shoving you and instead be excited to see “the kid with the gum.” That’s classical counter-conditioning! Listen to your bird. The next step is to start really listening to your parrot. I paid closer attention to his body language. If he bowed his head and opened his beak, I backed off. I might try to ask him to “target” his beak to my hand instead (see #3), or I might just respect his wishes to be left alone. Teach him how to behave instead. I taught Francis to “touch” his beak to my fingers. When I want to interact with him I start and end our time together with some target training. This gives us a way to interact without any stress at all. Targeting has never been associated with anything bad for Francis, unlike a “step up.” There have been times where his “step up” led to nail trims, a trip to the vet, or a beak trim. That’s why we introduced a new skill for him instead! Back to basics. Every time my parrot steps up onto my hand, he gets a treat. We gradually phase out the treats as he gets better about this. The goal is to continue rewarding him for good behavior. We’re rebuilding his trust. This is really important. 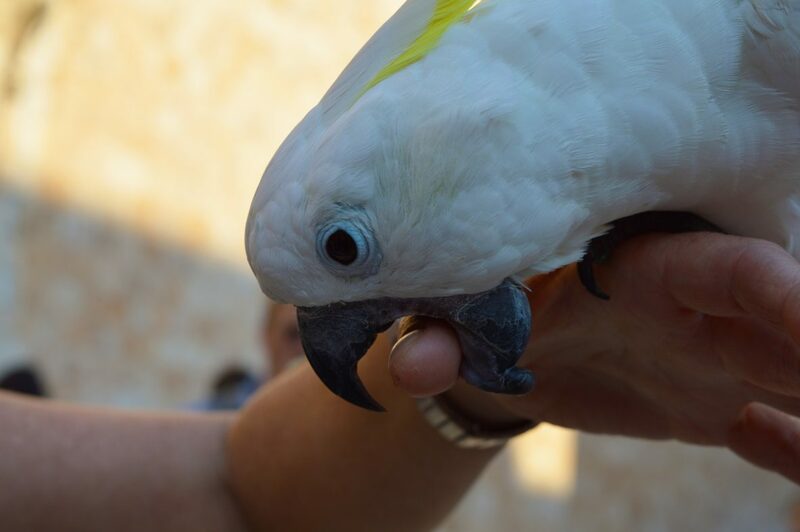 These four steps should stop (or at least reduce) parrot biting. This is also a good time to revisit a blog on frustration’s role in punishment. 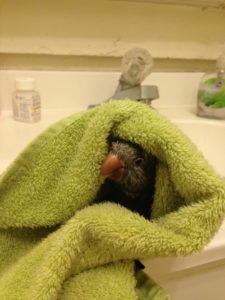 It can be really frustrating to have a screaming and biting parrot in your home. 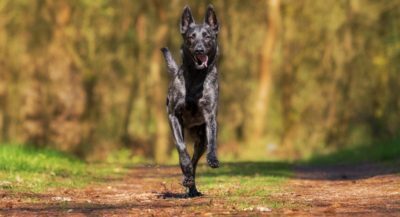 While this blog talks about dog training, it applies to parrots as well. Remember that trying to punish your parrot for screaming and biting will only stress him out more. Counter-conditioning should always be a first step! Why Does My Bird Want To Bite Me? He was molting. This can be uncomfortable and cause some mood swings. Some also promote the idea of hormone changes causing mood swings. This makes sense. My new schedule with the dog meant he was spending far more time alone and bored. His screaming increased (not sure why), and we started putting a blanket over the cage when he screamed. He learned that us approaching the cage was BAD, VERY BAD, so he started to scream and bite to keep us away! This obviously made the problem worse. Having the dog in the home probably stressed Francis out. Those are the methods I used to stop parrot biting. What did you do that worked in your home? I want to know! Hi Tracey! Aggression around the cage is pretty common, but can be fixable. We’ll have to teach your bird that you coming near the cage is awesome and teach him what to do instead of biting. If you’d like help, I am happy to offer behavior consulting for you or refer you to a parrot behavior expert near you!